Visits: 41738 persons viewed this recipe. 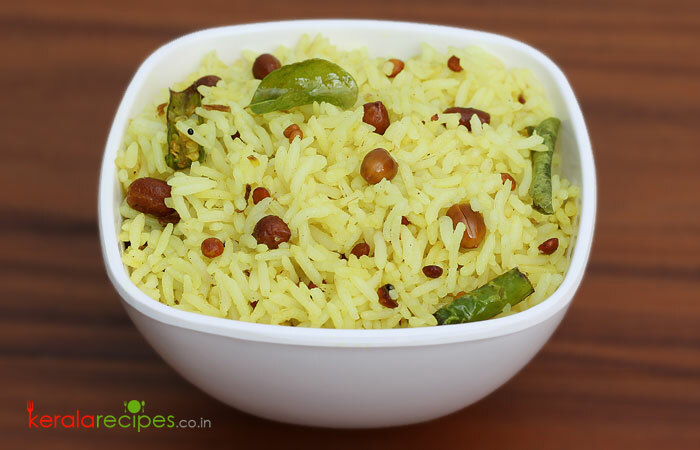 Lemon rice is easily one of the simplest yet most popular recipes in South India. It is a dish that is sometimes offered at several South Indian temples. Being a delicious dish, you can easily make it even in a hurry. What’s more, lemon rice can be made with leftover rice as well. For a simple but tasty meal, it is ideal to serve this variety dish with raita, pappad or chutney. Lemon rice is also a favorite lunch box option among kids. The tanginess of the lemon imparts a special aroma to this very simple delicacy. The recipe is very easy; it is done by mixing rice with spiced peanut and lemon mixture. The peanuts add a nutty flavor to the tangy and aromatic recipe. The tastiest and easiest lemon rice recipe is right here for you to read so as to find out the simple method to prepare this pleasant dish. Wash the rice. Cook rice in a vessel by adding enough water (8 cups) and 1 tea spoon of salt. When it is done, drain the excess water and keep aside (let it cool). Ensure that the grains are separate and not mushy so as to get aromatic and delicious lemon rice. Fine chop the ginger. Slit green chillies lengthwise. Heat 2½ table spoons of cooking oil in a pan. When the oil is hot, reduce the heat to low and add broken dry red chillies and mustard seeds. When the mustard seeds splutter, add split bengal gram (chana dal) and peanuts. Stir it for 1 minute and add split black lentils (urad dal). Keep stirring one more minute. Add ½ tea spoon of turmeric powder and 1 pinch of asafoetida powder. Stir well for few seconds. Add cooked rice, then lemon juice and salt to taste. Mix well and turn off the heat. Taste for salt. Transfer the lemon rice to the serving dish. 1) It can be served with pappad, pickle, chutney, raitha, plain curd etc. 2) The amount of lemon juice to be added depends on how tangy the lemon is as well as how tangy you would like the lemon rice to be. Is it ok if I prepare lemon rice with left over rice of one day before? Reena, of course you can prepare lemon rice with the left over rice. But make sure that the rice is good to eat. Thanks for the comment. Really inspired by your passion for cooking, being a software engineer. While trying the recipe, I got doubtful on the quantity of rice to be taken. Could you please help with the approximate weight to per cup ratio? Thanks in advance. Manu. Manu, 1 cup of medium grain rice weights around 200gm. Thank you very much for the comment. Thanks Shaan and I appreciate your interest in cooking. You are welcome Anirudhan. Thanks a lot for your great words of appreciation. Hi, Thanks for explaining in simple steps. Came out well. I added the walnuts and ground nuts which was all available here. I am gonna share with my friends. I love cooking and your site is really an inspiration.